Alec Baldwin Pulls Out Of Thomas Wayne Role In "Joker"
Brett Cullen Will Play Bruce Wayne's Father In "The Joker." So will the movie end with The Red Hood jumping in to a vat of chemicals while being pursued by Batman? See Joaquin Phoenix as The Joker — in Super-Creepy Makeup! Looks more like Gacy than the Joker. I keep watching that video, but it keeps cutting off after the part with Joaquin Phoenix dressed as a circus clown. What does the Joker look like? If they're calling it make up, forget it. If it's like "The Dark Knight Returns", then they've missed the point.of the Joker. He DOESN'T wear make up. His skin is permanently stained by acid. Change that and you've got Harley Quinn or The Clown (from the Flash series in the 80s.) But not the Joker. He cannot take off HIS makeup. The only way that look could be salvaged would be if he does have the green hair and white skin, and then in some sequence in the movie puts additional makeup on top of that for some reason. But that's complete grasping at straws, and unlikely to be true. Its only been a year since this Joker movie was first reported. So in response to the flaming failure of the Justice League, their response was, moar darkness, fast! I’m starting to get the feeling The Joker is actually running DCEU. All the signs are there. Crazy, maniacal decisions that lead to chaos and despair. And the inevitable defeat by Batman (err....Marvel Studios). The worst thing about this film to me is that it actually has a really amazing cast, which could produce a great film, even a great film about the Joker's origin. But this doesn't look to be it. So its a massive squandered opportunity. I mean, really, do you think you're ever going to get DeNiro to do another superhero film? DC/Warner made every bad decision conceivable to man in their wanna-be superhero shared universe. It's almost impossible for me to get excited about anything they put out. I'm cautiously optimistic about this one. I think Phillips is an interesting, underrated director and Phoenix is a good choice for the lead. Martin Scorsese (!) and Robert De Niro (!!) are also involved. I'm liking the vibes of the screen test video they put out, even with that makeup it feels like The Joker to me. Also, The Joker's "civilian name" on this one will be Arthur Fleck (get it? A.Fleck)... maybe they're going meta on this one and for the Joker i think that may somehow work. I just realized...Jack Nicholson is the most accurate live action portrayal of the Joker in the movies...and apparently that isn't going to change anytime soon. Wait..I forgot that the 60's series had a movie. So it's between Cesar Romero and Jack. Cesar probably gets the edge for not having an origin (and for not gunning down Bruce's parents). Jack Nicholson did a great job as the homicidal completely insane Joker... the grim and gritty 80s Joker. And while I usually use "grim and gritty" as a perjorative, Nicholson was indeed perfect as the Joker. Cesar Romero was hilarious and dangerous. He was perfect for the TV show. He was FUN. It's 2015, and I don't know if there's any room for fun in super hero TV shows and movies any more. So, I'm guessing from this that you just came out of a three year coma and haven't caught up on the Marvel films? Steve - Dammit, my fingers missed. Of course I meant (and updated to) 2018. You are 100% right about Marvel movies. But I was referring more to DC movies. Even the light moments in Wonder Woman and Justice League were kinda heavy. I feel an overwhelming desire to never, ever watch this. The same can, unfortunately, be said for much of DC's output these last few years. I can easily count on one hand the number of GOOD DC-related movies we've had since the original SUPERMAN made its debut 40 years ago. Is this new version of the Joker supposed to look like a combination of Cesar Romero and Heath Ledger? 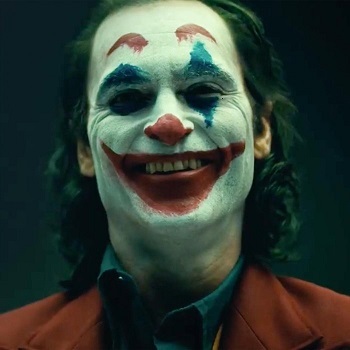 I think Joaquin Phoenix has the acting chops to be a potentially brilliant Joker. From what I've seen with that make-up job, I fear they are well off the mark, however. They are off the mark probably because everyone involved with this movie has Heath Ledger in mind, not the Joker. You are right - I would argue that since Heath Ledger's death, they have been trying, in one form or another, to replicate his Joker. They're putting a great actor into what so far looks like may be total garbage, to make the DCEU movies look great in comparison. To take people's minds off the fact that most of the DCEU movies stink on ice.